Context: With the continuing rise in the number of immunocompromised patients, the incidence of invasive mycoses has increased. Various studies have reported the trends of fungal infections in autopsies. Because of limitations in antemortem clinical diagnosis owing to lack of sensitive diagnostic tools, information regarding frequency and pathogenesis of fungal infections is largely dependent on autopsy studies. Aim: To study the prevalence of fungal infections at autopsy spanning a period of 20 years and to document recent trends, prevalence of various fungi over decades along with underlying predisposing factors and pathological findings. Settings and Design: Retrospective study. Materials and Methods:All autopsies between 1988 and 2007 were reviewed and all cases showing fungal infections were analyzed. The clinical details and demographic data were retrieved from medical records. Representative sections from all organs were stained with hematoxylin and eosin stain and special stains including Gomori's silver methenamine (GMS) and per-iodic acid Schiff (PAS). Culture details were noted, wherever available. Results: A total of 401 autopsies were performed during the study period. Fungal infections were identified in 35 (8.7%) of these cases. Leukemia was the commonest risk factor. The commonest pathogen in the present study was Aspergillus sp. The commonest single organ involved was brain (n = 18). Culture positivity was seen in 23.8% cases. Conclusion: The study highlights various predisposing factors and organisms in autopsy series. Existing diagnostic modalities are not sensitive to ensure antemortem diagnosis of fungal infections. With the continuing rise in the number of immunocompromised patients, the incidence of invasive mycoses is on the rise. Fungi can be either "pathogenic" to cause infection in a normal host, or "opportunistic" causing disease in patients with abnormal host defenses. Various studies have reported the changing trends of fungal infections in autopsies. ,, Newer fungal pathogens like non-albicans Candida, various species of Zygomycetes and Penicillium species are also being increasingly reported over the last 10 years. Because of limitations in antemortem clinical diagnosis owing to lack of sensitive diagnostic tools, information regarding frequency and pathogenesis of fungal infections is largely dependant on autopsy studies. In India, autopsy studies are limited to a few centers. Considering this, we aimed to study at our institute, the prevalence of fungal infections at autopsy spanning a period of 20 years to document the prevalence of various fungi over two decades along with underlying predisposing factors and pathological findings. This was a retrospective study carried out in a university multispeciality hospital with active oncology, neurology and cardiology services and an ongoing renal transplantation program. All autopsies between 1988 and 2007 were reviewed and all cases with fungal infections were analyzed. All hospital deaths were not autopsied and medicolegal cases were referred to another center for postmortem. Only deaths where clinician felt a need for definitive diagnosis were sent for autopsy, after obtaining consent from close relatives. This policy limited the number of autopsies. Clinical details and demographic data were retrieved from medical records. Age, gender, presenting features, predisposing risk factors and the organism were noted in every case. At autopsy, blood, body fluids, cerebrospinal fluid (CSF) and tissues from relevant visceral organs were submitted for culture examination as a routine practice. Blood was cultured using standard aerobic and anaerobic activated charcoal liquid media. If these showed growth colonies, then it was further sub-cultured on solid media including blood agar, chocolate gar and MacConkey agar. For fungal culture, Sabouraud's dextrose agar, inhibiting mold agar and brain-heart infusion agar were used. The body fluids, CSF and tissue were directly cultured on solid media. The nature of organism was further identified by Gram stain, KOH mounting or calcofluor white stain, as per the requirement. 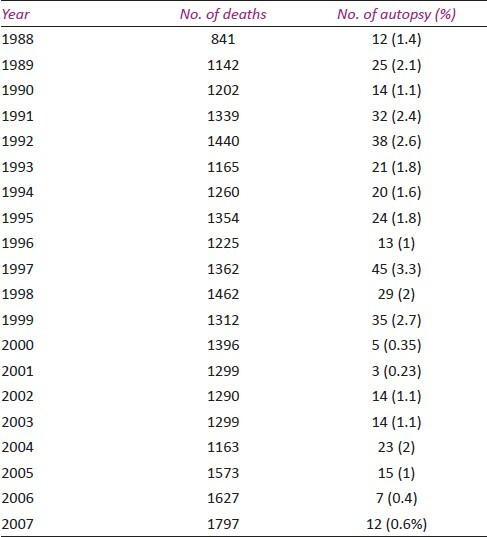 The number of hospital deaths and the number of autopsies in the study period are given in [Table 1]. The total number of autopsies performed during the study period was 401 and fungal infections were identified in 35 (8.7%) of these cases. Seventeen were complete autopsies, and 10 and 8 were partial autopsies limited to brain and thoracoabdominal organs, respectively. Autopsies were performed within 4 hours of death, after obtaining informed consent. The autopsies included 26 males and 9 females with age ranging from 5 to 60 years. The period of hospital stay varied from 24 hours to 60 days. The details about clinical features, predisposing factors, pathology and causative organism according to organ involvement are provided in [Table 2]. 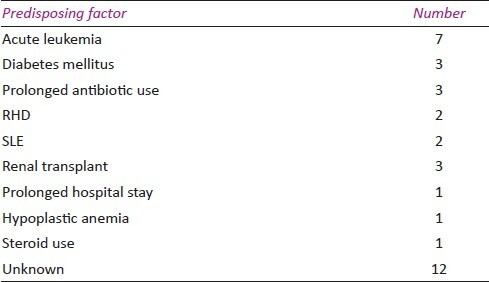 The list of predisposing factors is given in [Table 3]. Leukemia was the commonest predisposing factor (n = 7). Three of these patients were severely neutropenic [absolute neutrophil count (ANC) < 500/ml] for more than 14 days before the diagnosis. Three other patients had ANC ranging between 500 and 1200/cmm , and in one patient, the count was normal. None of these patients were on antifungal prophylaxis. One of the patients was on regular treatment with steroids (40 mg/day for 4 weeks). Fungal infections in three post-renal transplant patients were noted at intervals of 7 years, 2 years and 2 months, following transplantation. All the three patients were on maintenance immunosuppression. Graft function was good in all the three and none had prior rejection episodes. Two of the patients had positive serology for cytomegalovirus (CMV) and one developed post-transplant diabetes mellitus. Prolonged antibiotic treatment as a predisposing factor was noted in three patients. These patients were treated with antibiotics for pyrexia of unknown origin (PUO). In both the patients of systemic lupus erythematosus (SLE), the diagnosis of SLE was established along with fungal infections. They were not treated with steroids earlier. In 12 patients, no known predisposing factor could be identified. In majority of the patients (n = 28), fungal infection was not suspected antemortem. Multiple antemortem bacterial and fungal cultures of blood and other body fluids were done in 21 patients. In 11 of these, the cultures were sterile. In five (23.8%) of these patients, fungal organisms were cultured and patients were started on antifungal therapy with amphoterecin B or fluconazole. In six patients, the culture yielded various gram-negative organisms and patients were treated with antibiotics. Postmortem cultures yielded positive results in eight patients. In rest of the patients, the identification of fungal infection was based solely on morphologic characteristics. In all patients, autopsy was performed within 4 hours after death and presence of fungi in culture was always associated with fungi in tissue sections and tissue reaction. The commonest pathogen in the present study was Aspergillus sp. (n = 18; 53%), followed by Zygomycetes species (n = 4; 12%). There was no change in the common pathogenic fungi in the two decades of the study. However, infections due to P. jirovecii, Rhodotorula glutinis and pheohyphomycosis were encountered in the later decade. The commonest organ involved was brain (n = 18) followed by lung (n = 14) and heart (n = 6). Multiple organ involvement was noted in seven patients. 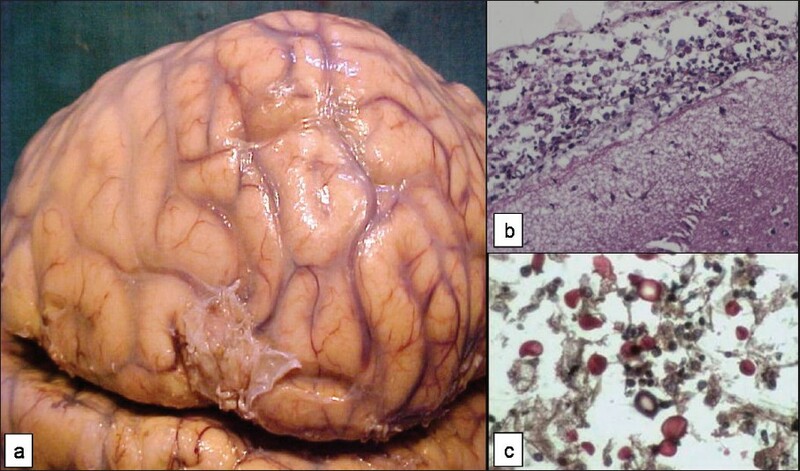 In brain, hemorrhagic infarct was the most common pathology followed by suppurative inflammation and meningitis. Meningitis was seen with cryptococcosis [Figure 1] and zygomycosis. Mycotic aneurysm and vasculitis of basilar artery with bland infarcts was noted in two patients due to vascular invasion by Aspergillus sp. Suppurative granulomatous reaction was observed in an isolated case of cerebral pheohyphomycosis developing in an immunocompetent individual. 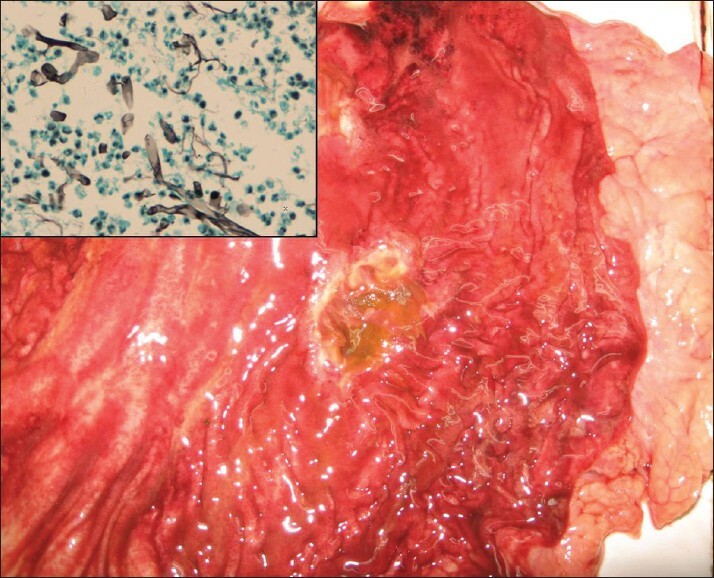 In cases of invasive pulmonary aspergillosis, hemorrhagic infarcts were the commonest underlying pathology [Figure 2]. Vascular invasion was identified in two cases. Abscess formation was noted in two patients, and in the other two, there was bilateral mycotic bronchopneumonia. Lung involvement by candidiasis and zygomycosis was in the form of multiple abscesses. 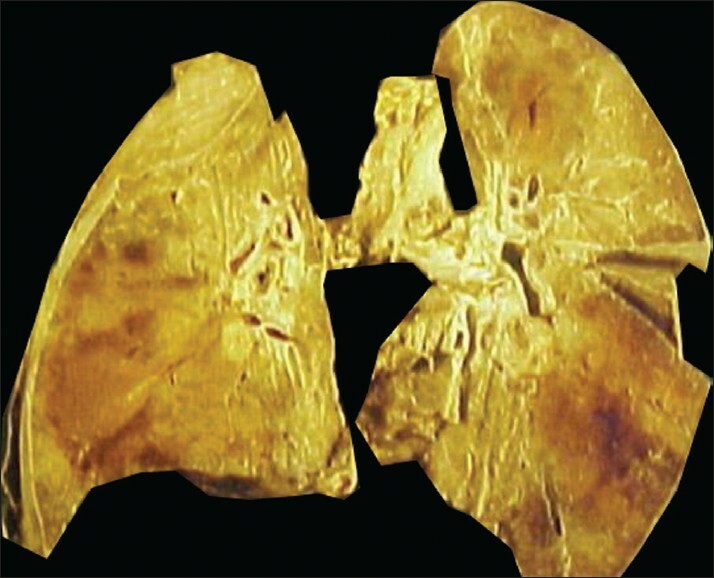 Coexistent active tuberculosis in lung was noted in two of the patients. P. jirovecii pneumonia showed characteristic frothy exudates in the alveoli with cup-shaped cyst forms on GMS. Mycotic endocarditis was noted in six patients of whom two had prior rheumatic heart disease. In all the cases, there was evidence of embolic dissemination of fungal organism to other organs, manifested by septic infarcts and abscesses in liver, spleen, kidney and lung. There were two cases of right-sided endocarditis with coexistent septic pulmonary infarcts. A single patient with gastric zygomycosis was present in the series. The patient presented with symptoms of perforative peritonitis. At surgery, pus was noted in the peritoneal cavity. However, exact site of perforation was not identified. Repeated fungal cultures of blood and peritoneal fluid were sterile and he was treated with broad-spectrum antibiotics. Postoperatively, the patient developed respiratory failure and died. At autopsy, a perforation was identified in the fundus, which showed broad nonseptate hyphal forms of Zygomycetes species with vascular invasion [Figure 3]. There is a worldwide decline in the number of autopsies performed. In India, autopsies are performed in a very few centers. In our institute, limited numbers of autopsies are performed as all hospital deaths are not autopsied. The decision to get consent for autopsy is largely influenced by the academic interest of clinician and the policy decisions of the administration. There were no HIV seropositive or medicolegal cases for autopsy in this series. All these factors greatly affect the prevalence of the disease and the actual figures observed in this study may not be a true indicator of prevalence of fungal infections in the general population. However, the study highlights a few features regarding fungal infections as a contributing cause of death. The overall prevalence of fungal infection showed a rising trend in the last two decades. Similar reports have been published from India earlier and this is attributed to variability of climatic conditions of this country. The newer chemotherapeutic and antibiotic modalities, transplant facilities, stay in critical care units are additional factors which contribute to the overall increase in the incidence of fungal infections. The predisposing factors like acute leukemia , renal transplantation, prolonged steroid/antibiotic use, diabetic mellitus and SLE, seen in the present study, are well-known risk factors for fungal infections. Invasive and disseminated fungal infections leading to multiple or more than one organ involvement and central nervous system (CNS) involvement were responsible for the mortality in our patients. In the present study, the identification of fungus was made on the morphologic grounds in a majority of cases. Aspergillus species typically show septate hyphae with dichotomous acute angle branching; however, this morphology was also seen in other genera like Fusarium, Penicillium, Paecilomyces and Sudosporium. Culture confirmation is necessary to identify the species. Fungi like Pheohyphomycetes, R. glutinis and P. jirovecii were identified in the later decade, emphasizing the change in the trend of the infections. Though autopsies in AIDS patients were not undertaken, the latter two organisms which were more usually reported in AIDS patients were seen in our series. Fungal endocarditis is associated with high mortality despite treatment and all our patients were diagnosed at autopsy only. Newer organisms like Pheohyphomycetes are being recognized as human pathogens. It is a melanin containing dematiaceous fungus which often occurs in immunocompetent individuals. The melanin confers advantage on survival to these fungi by scavenging the free radicals. As the primary focus in our patient could not be detected, cerebral manifestation was considered to be hematogenous spread from a subclinical pulmonary or subcutaneous lesion. Brain was the commonest single organ involved. This probably is due to more number of partial autopsies limited to brain and also more autopsies from neurology services. The pathology in most of the cases showed vascular invasion and dissemination, accounting for the mortality. The antemortem diagnosis of fungal infection always poses a problem. Other studies also reported that fungal infections are frequently missed clinically and often diagnosed only at autopsy. In the present series also, majority of fungal infections were not suspected antemortem and detected only at autopsy. The diagnosis of fungal infections relies on microscopy, culture and pathogen specific tests. Histological proof may not be possible in all the patients, especially in deep seated organs inaccessible to biopsy. Low yield on culture is another unfortunate fact that remains common to all kinds of fungal organisms. In the present study, the positivity of culture examination was found to be very low. Newer rapid and non-culture based methods like polymerase chain reaction (PCR), galactomannan antigenemia, western blot and detection of fungal metabolites like d-arabinitol are being developed. A high index of clinical suspicion with vigilant laboratory help and use of antifungal agents as empirical therapy in suspected cases will definitely improve the outcome and reduce the mortality associated with these infections. The present data are not sufficient to project the entire hospital status of these infections because all deaths were not autopsies. However, the study definitely highlights the newer trends in fungal pathogens, with more stress on predisposing factors and organism. It also highlights the fact that existing diagnostic modalities are not sensitive to ensure antemortem diagnosis of fungal infections. There is a definite need to develop the newer molecular methods for diagnosis of these infections. The present study at best represents the problem as a tip of an iceberg. 1. Groll AH, Shah PM, Mentzel C, Schneider M, Just-Nuebling G, Huebner K. Trends in the postmortem epidemiology of invasive fungal infections at a university hospital. J Infect 1996;33:23-32. 2. Kanda M, Moriyama M, Ikeda M, Kojima S, Tokunaga M, Watanabe G. A statistical survey of deep mycoses in Japan, with particular reference to autopsy cases of cryptococcosis. Pathol Int 2004;24:595-609. 3. Chakrabarti A, Chander J, Kasturi P, Panigrahi D. Candidaemia: A 10-year study in an Indian teaching hospital. Mycoses 1992;35:47-50. 4. Fleming RV, Walsch TJ, Anaissie EJ. Emerging and less common fungal pathogens. Infect Dis Clin North Am 2002;16:915-33. 5. Sundaram C, Prayaga A, Vemu L, Sadasivan J, Murthy JM, Digumarti R, et al. Fungal endocarditis: an autopsy study. Asian Cardiovasc Thorac Ann 2004;12:95-8. 6. Sundaram C, Mahadevan A, Laxmi V, Yasha TC, Santosh V, Murthy JM, Purohit AK, Mohandas S, Shankar SK. Cerebral zygomycosis. Mycoses 2005;48:396-407. 7. Sundaram C, Umabala P, Laxmi V, Purohit AK, Prasad VS, Panigrahi M, et al. Pathology of fungal infections of the central nervous system: 17 years experience from South India. Histopathology 2006;49:396-405. 8. Uppin MS, Challa S, Uppin SG, Alladi S, Yarlagadda JR. Cerebral Aspergillus arteritis with bland infarcts: A report of two patients with poor outcome. Neurol India 2007;55:298-300. 9. Sundaram C, Goel D, Uppin SG, Seethajayalakshmi, Borgohain R. Intracranial mycotic aneurysm of Aspergillus species - report of two patients with fatal outcome and review of literature. J Clin Neurosci 2007;14:882-6. 10. Goel D, Reddy SR, Sundaram C, Prayaga AK, Rajasekhar L, Narsimulu G. Active necrotizing cerebral vasculitis in systemic lupus erythematosus. Neuropathology 2007;27:561-5. 11. Chakrabarti A. Microbiology of systemic fungal infections. J Postgrad Med 2005;51:16-20. 12. Rex JH, Bennett JE, Gallin JI, Malech HL, Melnick DA. Normal and deficient neutrophils can cooperate to damage Aspergillus fumigatus hyphae. J Infect Dis 1990;162:523-8. 13. Gerson SL, Talbot GH, Hurwitz S, Strom BL, Lusk EJ, Cassileth PA. Prolonged granulocytopenia: the major risk factor for invasive pulmonary aspergillosis in patients with acute leukemia. Ann Intern Med 1984;100:345-51. 14. Yamazaki T, Kume H, Murase S, Yamashita E, Arisawa M. Epidemiology of visceral mycoses: analysis of data in annual of the pathological autopsy cases in Japan. J Clin Microbiol 1999;37:1732-8. 15. O'shaughnessy EM, Shea YM, Witebsky FG. Laboratory diagnosis of invasive mycoses. Infect Dis Clin North Am 2003;17:135-58. 16. Bodey G, Bueltmann B, Duguid W, Gibbs D, Hanak H, Hotchi M, et al. Fungal infections in cancer patients: an international autopsy survey. Eur J Clin Microbiol Infect Dis 1992;11:99-109. 17. Hotchi M, Okada M, Nasu T. Present state of fungal infections in autopsy cases in Japan. Am J Clin Pathol 1980;74:410-6. 18. Brown J. Zygomycosis: an emerging fungal infection. Am J Health Syst Pharm 2005;15:2593-6. 19. Marr KA, Carter RA, Boeckh M, Martin P, Corey L. Invasive aspergillosis in allogenic stem cell transplant recipients: changes in epidemiology and risk factors. Blood 2002;100:4358-66. 20. Young RC, Bennett JE, Vogel CL, Carbone PP, DeVita VT. Aspergillosis: the spectrum of the disease in 98 patients. Medicine 1970;49:147-73. 21. Tarrand JJ, Lichterfeld M, Warriach I, Luna M, Han XY, May GS, et al. Diagnosis of invasive septate mold infections: a correlation of microbiological culture and histologic or cytologic examination. Am J Clin Pathol 2003;119:854-8. 22. Groll AH, Gea-Banacloche JC, Glasmacher A. 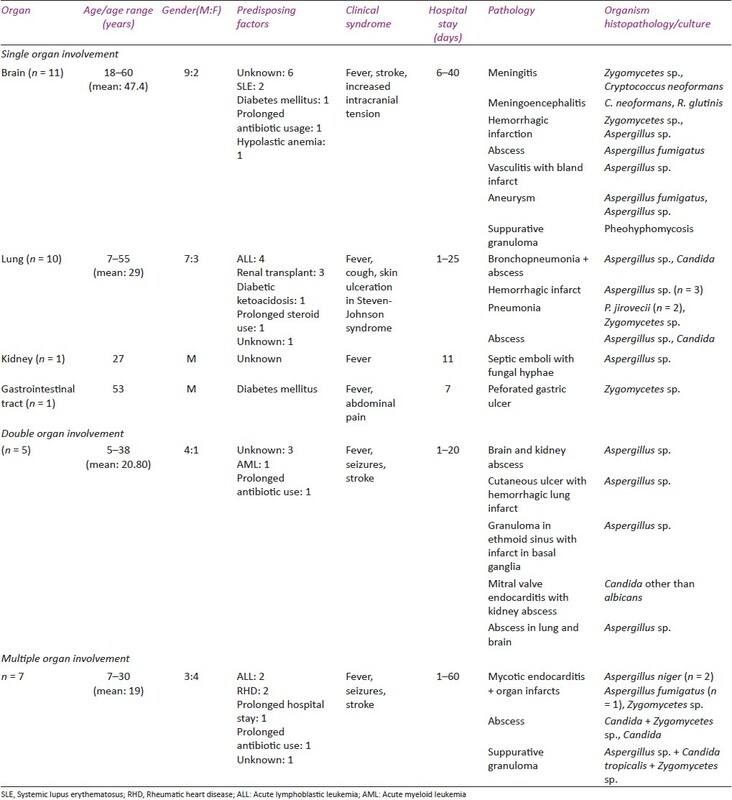 Clinical pharmacology of antifungal compounds. Infect DIs Clin North Am 2003;17:159-91. 23. Revankar SG, Sutton DA, Rinaldi MG. Primary central nervous system pheohyphomycosis: A review of 101 cases. Clin Infect Dis 2004;38:206-16. 24. Sarode VR, Datta BM, Banerjee AK. Autopsy findings and clinical diagnoses: a review of 1000 cases. Hum Pathol 1993;24:194-8. 25. Reiss E, Obayashi T, Orle K, Yoshida M, Zancope-Oliveira RM. Non culture based diagnostic tests for mycotic infections. Med Mycol 2000;38:147-59. Louie, C., Schwartz, L.E., Litzky, L.A., Nachamkin, I., Montone, K.T.